Set up a direct debit to easily pay for your National Trust membership. When you pay this way you can also enjoy a free gift, delivered straight to your door. A membership entitles you to free entry and free parking at 500 National Trust properties around the UK including castles, stately homes, historic buildings and parks and gardens. There is something for everyone and you are sure of some really interesting and enjoyable days out. Many venues charge for parking but if you are a National Trust member you will get free parking, which repesents great value and helps to make savings on a great day out for all members of the family. Sign up to the National Trust newsletter and gain exclusive access to all the latest offers, deals and sales. You can also save 10% on any purchase whether it be accessories, homeware or clothing. Begin your National Trust membership with a friend or your partner and enjoy days out as a pair all over the UK. If you are over 60 and have been a member of the National Trust for at least five of the last ten years, you can take advantage of this amazing discount for senior members and enjoy free days out and tourist visits to beaches and properties all over the UK. Family memberships are just £10.50 a month and provide you with some amazing days out for all the family. Many of the National Trust properties arrange special events for children, especially during school holiday periods, to ensure visits are interesting for all ages. Where do I use my National Trust voucher code? Click ‘Get Code’ to reveal and copy the National Trust membership discount code. Head over to the ‘Join & get involved’ section. Scroll down to the Join section and click on ‘Become a member’. Choose from Individual, Joint, Family or Lifetime memberships. Then choose from Adult, Young Person or Child before choosing ‘Buy for Myself’ or ‘Buy as a Gift’. Enter your discount code before entering your payment details on the order summary screen. "Sign up to the newsletter for the latest National Trust membership offers and deals." National Trust is a charity that protects and opens to the public over 350 historic houses, gardens and ancient monuments. The National Trust sites are based throughout the UK and you'll be able to visit each one as many times as you like as a member. Running solely on membership fees and donations, National Trust preserves these stunning places, so that they can be enjoyed by many for years to come. Having been in operation since 1884 The National Trust helps to protect and preserve not only houses but forests, woods, fens, beaches, farmland, moorland, islands, nature reserves, and castles plus many other places of historical and environmental interest. Visiting a National Trust property is an ideal way to learn about history whilst at the same time enjoying the beauty and splendor of the buildings and the surrounding areas, or you can wander around and imagine yourself as lord of the manor! What does The National Trust Membership offer? When purchasing a National Trust Membership, your subscription enables you to view many stunning historic houses and gardens, industrial monuments, and social history sites. Your National Trust fees also give you access to a variety of scheduled events at many of the sites throughout the year making their prices real value for money. There are plenty of family-friendly events scheduled during the school holidays, such as wildlife watching, minibeast trails, pond dipping or craft making activities. These are always well loved by all and allow kids to have fun outdoors in the fresh air, while also learning about the world around them. There is also more adult based events available to enjoy including, murder mystery evenings, activity trails, walks and even the opportunity to dine in a medieval castle! These are just a few of the great events on offer. They also own over 35 characterful pubs offering, scrumptious food, a range of ales and a very warm welcome. There are great walking opportunities available near to each pub, making them a great based to enjoy an active day out. For those of you who aren’t so mobile, The National Trust disabled membership scheme allows for a carer to be admitted free of charge on request. The trust relies on membership fees, donations and legacies to be able to carry out its work and has over 61,000 volunteers in its service. By taking out a membership your fees will be contributing to the preservation of these beautiful places, whilst enjoying the great benefits that come with a National Trust subscription. All members have access to over 500 places, so you will never be stuck for somewhere new to explore. Your membership will allow you unlimited access to all these fantastic places, meaning you can visit as many times as you want. You could visit the same gardens at different times of the year and enjoy a different experience in each season, or perhaps split a visit to a historical house over a couple of days and enjoy the history of the inside of the house one day and really explore the grounds on your second visit. There are 3 different membership options, you can join as an individual or take out a joint membership and enjoy exploring new places with a partner, friend or family member. Or there is an option for a family membership, giving you endless days out to choose from with the kids. 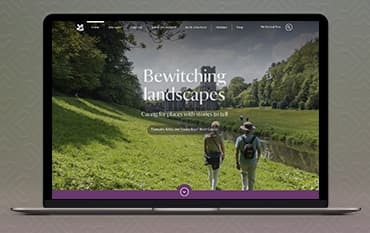 The National Trust website is jam-packed full of information about the National Trust, the work it carries out and also the places you can visit that belong to them that's all included in the cost of a membership. Clearly displayed towards the top of their homepage is a search function, enabling you to find out the National Trust sites nearby to you. Simply enter your location in the search box and a menu of nearby places to visit will pop up, you could also view this information on a map. Even if you become familiar with the National Trust sites that are close by to where you live, this function can help you plan days out further afield, or if you are planning to holiday in the UK, you could see which sites will be nearby to your holiday destination. Each National Trust site has its own information page, that includes everything you will need to know before your visit. From opening times, facilities and ticket prices (should someone in your party not be a member) to everything that you can do on your day out and any planned activities and events. There is a section of the website dedicated to days out inspiration, if you are looking for something different to do with your family or friends, this section will show nearby places and events. You can easily find out information about the good work that the National Trust do and also their plans for future work on their website, with the option to sign up to the newsletter if you wish, to be kept up to date with local events. Signing up online is an easy process with key information clearly displayed and a minimal form to fill out. There is a range of membership options including individual, family, joint and life membership to choose from. Any questions can easily be asked through the 'Need Help' section during sign up. These queries will be answered straight away by National Trust staff during office hours. If I pay upfront by card do I still get a free gift? No, the free binoculars are only given to new members paying online by Direct Debit. Why can’t I purchase a life membership via Direct Debit? Joining the National Trust as a life member is a one-off purchase, therefore National Trust can’t offer payment by Direct Debit. I have more than 10 children or grandchildren. Can I include them on my family membership? Yes, you can. You can either join online with details of 10 children and then call later to add the details of the other children or join at one of National Trust's places, or over the phone when they'll take the details of all of the children. The National Trust offers you membership with a range of options from single, joint and annual membership. Included in your National Trust Subscription is the chance to visit over 350 historic houses, gardens and ancient monuments. Being a charity the National Trust has to charge people to visit these fantastic properties. To benefit from the latest National Trust membership offers just use one of our National Trust Promotional Codes to save money on your membership. You can also pay membership fees for your child separately, or opt for a family membership option - enabling you to enjoy many Family Days Out together.